How do I create and download a report? 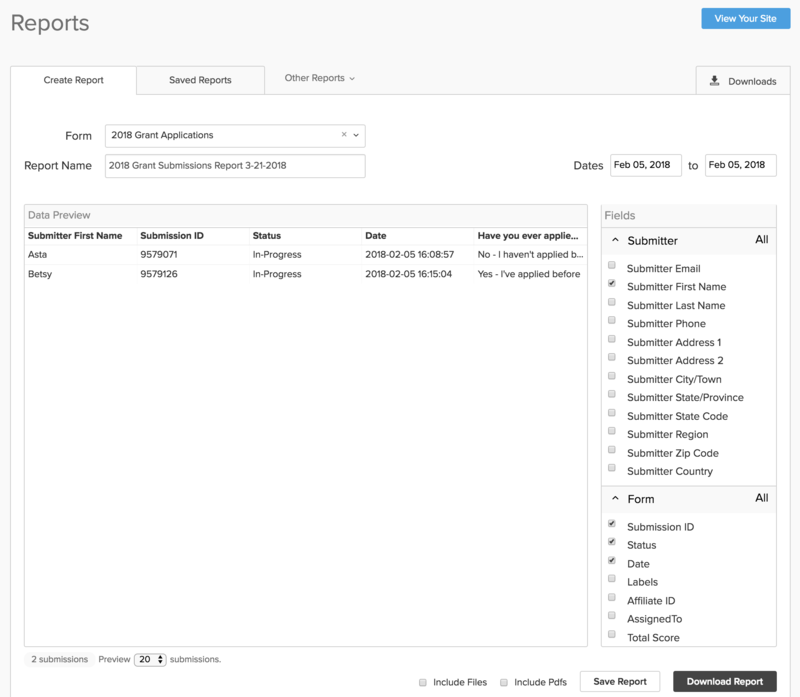 Submittable enables your organization's level 4 and 5 team members to create, save, and download reports with customized content about collected submissions. Click the Reports menu in the upper-right corner of your account. Select Create. In the Form dropdown menu, click the arrow in the dropdown menu to expand the menu and select the form name. Or, you may also type the name of the form for which you’d like to create a report, and select the form name when it appears. Click the X next to the form name to clear the menu and choose a new form. By default, the date range for which you can view data will be from the date at which the form received its first submission to the date at which the form received its latest submission. Edit the Dates fields as needed. In the Fields toolbox, expand the Submitter and Form sections by clicking on each section name. Choose the fields for which you’d like to see data. You can choose from Submitter fields (such as email, first and last name, and address) and Form fields (such as Submission ID, status, score, and specific fields from your form). If your form uses a custom review form, you can select review form data in a Reviews section. If an additional form has been sent for submitters to this form, you can choose additional form data in section(s) titled after the unique name of each additional form request. When you’ve finished selecting fields for your report, click the Report Name field to name your report. On the Downloads page, locate your report. Click the Download button next to it. Your report will be in a ZIP format. Click the Reports menu in the upper-right corner of your account. Select Submissions. In the Report dropdown menu, type a search query to find a previously saved report created by you or your team members. Or, click the arrow in the dropdown menu to expand the menu and select the report name directly. Click the X next to the report name to clear the selected report and choose a new one. A preview of the saved report will appear in the Data Preview window. Edit the date range in the Dates section and change the selected fields in the Fields toolbox as needed. Follow steps 6 to 10 above to name and download your report.